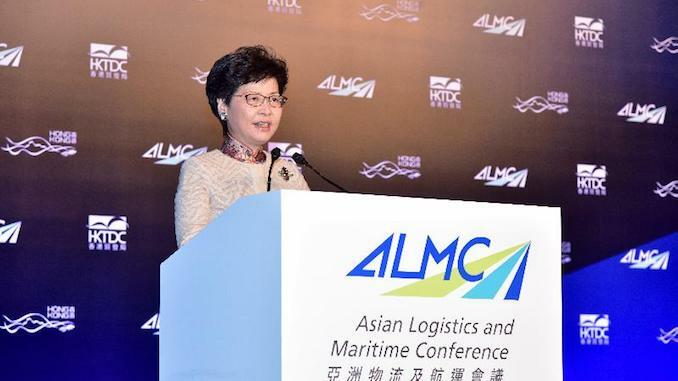 Hong Kong Chief Executive, Carrie Lam opened proceedings at the 8th Asian Logistics and Maritime Conference, to a capacity audience at the Hong Kong Convention Centre yesterday (20 November). 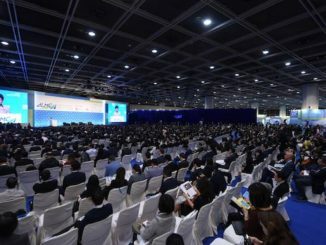 Delegates from more than 30 countries joined local maritime and logistics professionals at the flagship event of Hong Kong’s third Maritime Week. Amid rising concerns over the on-going US-China trade war Ms Lam took the opportunity to emphasise Hong Kong’s free trade credentials. “As we all know, free trade is taking something of a thrashing these days, given the rising undercurrent of unilateralism and protectionism. Let me assure you, ladies and gentlemen, that for Hong Kong, the primacy of free trade is immutable, Ms Lam told an audience of more than 2,000 delegates. “ASEAN, as a group, is our second-largest trading partner. We signed a free trade agreement and related investment agreement one year ago this month, which will begin to take effect in January next year and will surely boost our trade, our investment and our overall connectivity. I am sure the Secretary-General [Dato Lim, Secretary General of the Association of ASEAN] will agree with me when I say that relations between ASEAN and Hong Kong have never been better, never more promising than they are now. “The agreements show that Hong Kong and the 10 member states of ASEAN believe in free trade, and in the mutual rewards trade and logistics can bring to our economies, our companies and our peoples,” she added. Ms Lam said that for Hong Kong, the primacy of free trade is immutable, while revealing that the territory had concluded free trade agreement negotiations with Australia just a few days ago. 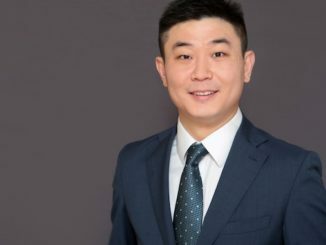 Ms Lam said that although Hong Kong’s local market may be modest, the territory’s “ability to serve and create markets, to trade in goods and services with the world, is inexhaustible”. She highlighted Hong Kong’s position as home to one of the world’s busiest transshipment container ports, serving about 320 liner ships a week and it’s linked to more than 470 ports worldwide. Last year, Hong Kong Port’s throughput stood at 20.8m teu, which accounted for 4% of the throughput of Asia, up 5% over the previous year. 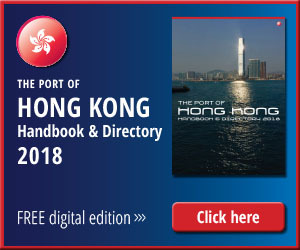 Hong Kong’s Shipping Register is the world’s fourth largest, with a gross tonnage of more than 120m. 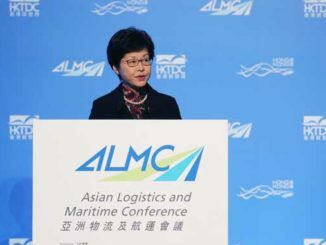 In the air, Ms Lam said that Hong Kong was a “force to be reckoned with” with its airport being the world’s busiest international air cargo hub for the past 22 years in a row. “Our airport handles more than 1,100 flights daily to over 220 destinations, including some 50 Mainland destinations. Last year, we moved 5 million tonnes of cargo and air mail, and handled 73m international passengers,” she said. The third runway under construction is expected to be commissioned by the end of 2024 and will be will be capable of handling 100m passengers and 9m tonnes of cargo annually. ALMC 2018 continues today against a backdrop of more than 50 seminars, forums, and activity-based events being held across the city as part of Hong Kong Maritime Week.